G U L F - F R O N T Blue Mountain Villas - Closest to Beach! describe this 1600+ square foot beach-front retreat! Our Non-Smoking, Gulf-Front Condo is one of the closest structures to the water's edge as it was built before the newer coastal setback requirements. In other words, you're practically ON the beach! Don't settle for less! The actual beach walkover (stairs to beach) is within 10 feet of the condo (see picture below). Unit 5A is located on the WEST END of the building. The unit gives you the sensation of being on a cruise ship with the wonderful panoramic views that are only available from a gulf-front unit located on the end of the building which is located closer to the water than any other condo in the Blue Mountain Beach area. 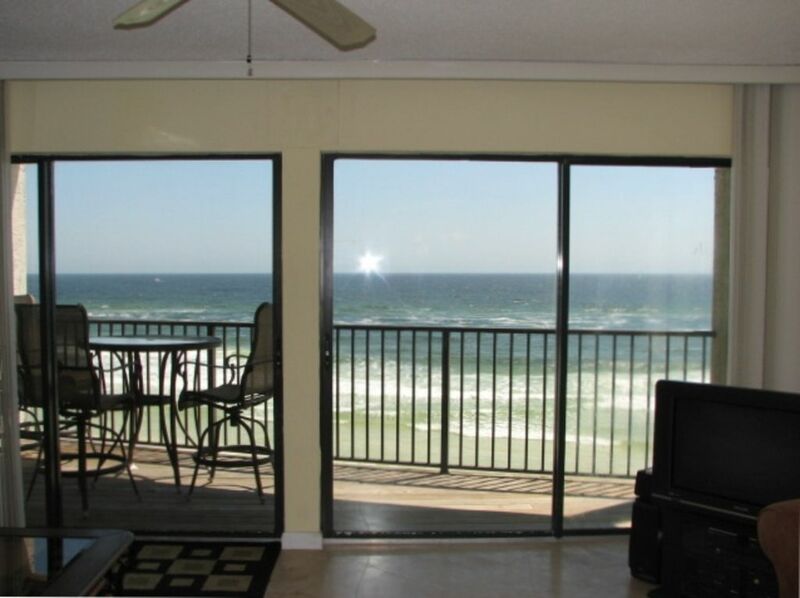 On a clear day, you can see all the way to Destin via the large side picture window while watching TV. It's also great for watching sunsets from the comfort of your sofa. The master bedroom which is Gulf-front has a king bed with its own bath. The guest bedroom has a queen bed and a set of bunk beds. And there is a guest bath. The living area has a queen sleeper sofa. There is a TV in each bedroom as well as a TV in the living area. Both full baths are tiled with a tub/shower. There is a half bath on the main level. The living, dining and kitchen areas have travertine tile. The kitchen has granite counter tops with stainless steel appliances. The 'carport' (no cars allowed) can be used to park your bikes out of the rain. NOTE!! Check out our LIVE 'beach-cam' on our main website, BlueMountainVillas (dot com). --No smoking permitted inside unit. Prorating of weekly rates instead of nightly rates will be considered for 5 or 6 night stays outside the summer season. We have owned Blue Mountain Villas units 5A and 5B since 2002 and truly love the Blue Mountain Beach area. This building is literally closer to the water than any building in the entire area. AND our units are located on the west end of the building which provide stunning and unobstructed views of the beach all the way to Destin. Beach access is really just a few steps away. We are self-managed, providing a personal touch that most rental agencies are challenged to Most of our guests are repeat as we strive to keep everyone happy. The unit has been listed on VRBO since 2003 so you can rent with complete confidence. Our condos are literally closest to the beach providing some of the best views as well as ultra convenience to the beach. WIRELESS INTERNET ACCESS!! Sorry, NO PETS allowed. My daughter and I spent last week at the beach for her Spring Break and could not have had a better experience. The condominium was very clean and comfortable. The view from both decks were fantastic and the proximity to the beach (just a few steps) can't be beat! We had a wonderful time and will definitely be back! Walking in and seeing the Gulf everywhere, took my breath away! I love Blue Mountain Beach, and this would be the property to which I would return every time; except too many others feel that way, too. So, I could tell a lie about it not being clean or sufficient, so that fewer would choose to rent this space:) But instead, I'll just keep trying to get a week in every year. Thank you, Albert and Margo, for making this experience available to us land-locked souls! We had the most relaxing stay. The views were amazing. You could hear the water with the doors opened or closed. There is nothing like being right up on the beach. We cant wait for our next visit! This place needs a serious re-model. The ceiling is cracked and open in the living and dining rooms. The sliding doors are extremely hard to open/close. The walls are in desperate need of paint and the carpet is filthy. I love the Blue Mountain area, but will choose another property next year. After being listed with VRBO since 2003, this by far is the harshest review we have ever received. Most reviews have been 5 stars with an occasional 4 (average of 4.8 including this last review). I am puzzled that the guest had nothing good to say about the unit. 2 out of 5 stars is totally unjustified. The hyper-critique should be obvious..."serious", "desperate" and "filthy". as indicated by our 2019 calendar (significant bookings already). We do plan to perform general maintenance including sliding door replacements.this winter, but it is not because of this review. By far the best place we’ve stayed at in Santa Rosa Beach area. The condo was spacious and steps away from the beach. We enjoyed eating breakfast on the balcony every morning and watching the dolphins play near shore. Many great restaurants close by and our kids loved the Blue Mountain ice cream shop that was within walking distance. Albert was great to work with. We will definitely be back!! Spring, summer and fall rentals are weekly only and go from Saturday to Saturday.